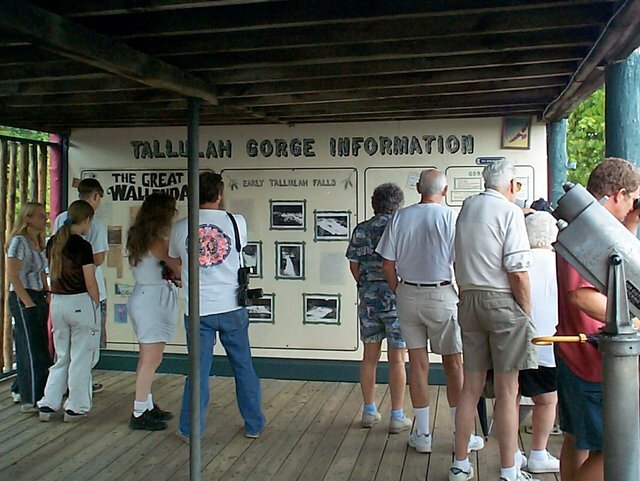 A century ago people called Tallulah Falls “The Niagara of the South.” It was one of Georgia's most popular tourist spots, drawing thousands of people a year to see the mighty Tallulah River with its six waterfalls, and to hike down into the Tallulah Gorge, which is two miles long and in places as deep as 1200 feet. At its peak, the little town was home to seventeen hotels and boarding houses, and in addition to the natural beauty of the river and the gorge, it offered restaurants, tennis, horseback riding, and music and dancing. 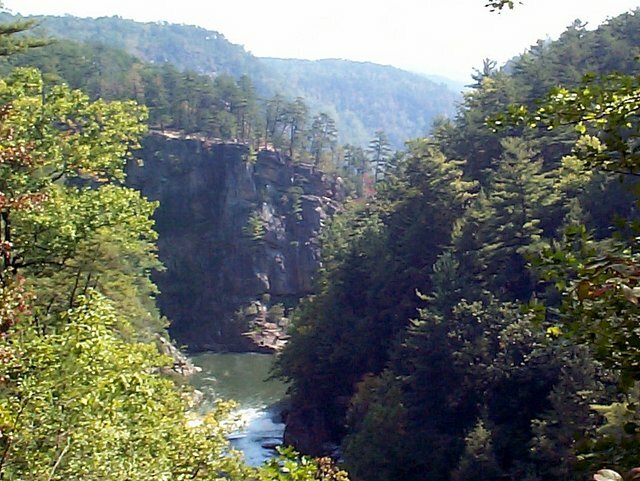 In 1912 the Georgia Railway and Power Company dammed the Tallulah River, reducing the Niagara of the South to a trickle. But Tallulah Falls, Georgia is as worth visiting today as it was a hundred years ago. Though the dam left the falls quiet for nearly 80 years, now regular controlled water releases bring the falls back to life several times throughout the year. But even when the dam fully holds back the Tallulah, the gorge itself is as awesome as ever. Anna and I had stopped in Tallulah Falls for only a few minutes back in July on our way to Gatlinburg. I thought the place was interesting enough for another visit, so I took a Wednesday off work and went back. Fortunately, and quite serendipitously (I didn't think to check the water release schedule before planning my trip), my visit was on one of the midweek water releases. I left my house at 8:15, stopped at a QuikTrip for the traditional cup of cappuccino and two Krispy Kreme donuts, and headed up U.S. 23. The drive is beautiful, and I took it slow. 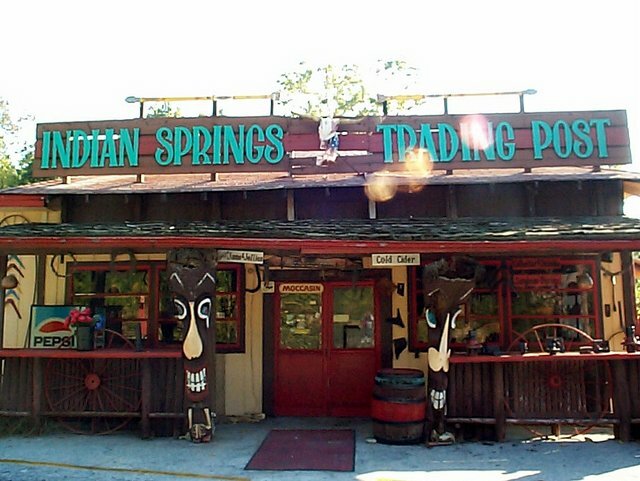 At 9:49 I pulled into a parking spot at the Indian Springs Trading Post on the 441 scenic loop. 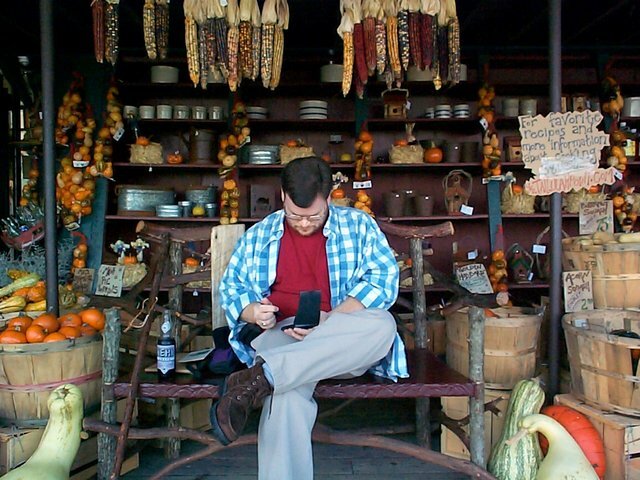 It was probably the Indian Springs Trading Post that first attracted me to the little town. I've admitted to my weakness for roadside attractions any number of times, and the faux western fort and genuine imitation Indian totem poles definitely tickle that part of my fancy. The Indian Springs Trading Post wasn't open, however, so I took a few pictures and moved down to Tallulah Point Overlook (“A mountain tradition since the 1920s”). 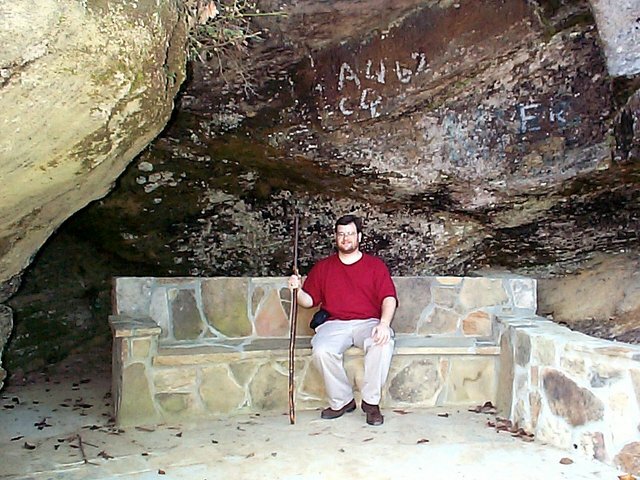 I browsed in the store for a few minutes and bought a grape Nehi, a walking stick, and a book about Tallulah Falls. There was a small but steady stream of people coming through, about five in the store at any one time. There were four other cars in the parking area when I got there, but about four more soon arrived. Next I went to the Tallulah Gallery (“Prints Originals Pottery”), looked around for a few minutes, and bought a couple of things—an enameled pin with a cat that looks like our Seuss for Annie, an angel medallion to give to my friend Pearl on her birthday. At 11:47 I turned in to the Terrora Lake part of Tallulah Falls State Park and discovered that on Wednesdays parking is free! Not that I would have minded paying the two dollars admission, but it didn't bother me to not pay it either. 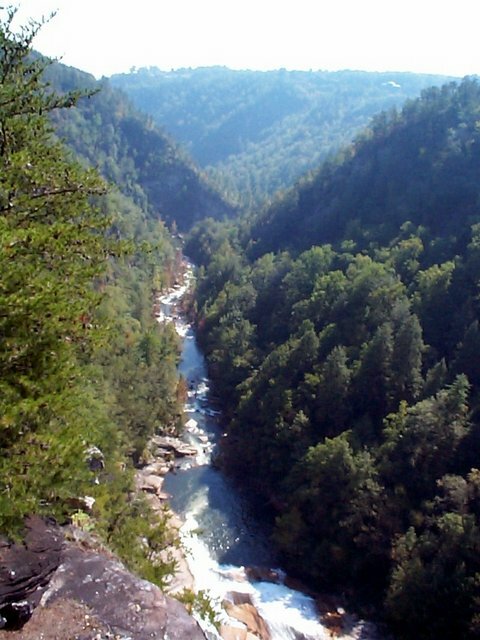 I parked in the shade, walked through the nature trail, sat on a bench by the lake for a few minutes, and then set off for the walk along the rim of Tallulah Gorge. The view from Overlook 5 I joined the trail at the midpoint, Overlook 5. My first thought was: what a place of splendid beauty! There was a breeze coming out of the gorge. The leaves were starting to change colors. Overhead, a pair of crows seemed to be having a cawing contest, and from across the gorge I heard the yapping of some small dog climbing the trails with his family. It took me about forty minutes to follow the trail along the north rim from Overlook 5 to Overlook 1. I was growing a little hungry, not having had lunch yet, but I was too excited to really think about food. What a wonderful place to be on an autumn Wednesday afternoon! At the end of the north rim, near Overlook 1, I went into the Jane Hurt Yarn Interpretive Center. The Center was named after an Atlanta environmental activist who was called “The Grand Dame of Conservation” by Southern Wildlife magazine. I walked around the center for a while, going through the history of Tallulah Falls exhibit, looking at the examples of flora and fauna found in the area, and browsing in the gift shop. I went into the little theater and watched the 15 minute film about the the area, and then headed out to the south rim. It took me about an hour to walk the south rim. There were a lot of friendly people out there, people who talk to The Author at the end of the South Rim you. There was one couple I first encountered on the north rim and who I met up with again along the south rim. They were probably both in their mid fifties, possibly from the Midwest; they were, the woman told me, meandering through north Georgia in their RV. The man had a gold earring and a mustache and wore an enviable brown hat. He let me look through his binoculars (also enviable) at one of the falls. At another spot we watched a green snake climbing a tree. I finished the south rim at about 4:30. My legs hurt and I was very tired and hungry, but also very happy. I intended to end the day by having a simple dinner of a hot dog or grilled cheese sandwich at the Cat Cafe at Tallulah Point Overlook, but it was just closing down as I arrived at 5:00. Instead, I went to Isabelle's. Isabelle's is a big white house on a hill that you pass on 441; I imagine that in a past life it was home to some wealthy family, one of the ones that found prosperity in the late 1800s tourist boom only to see it all taken away by the dam. 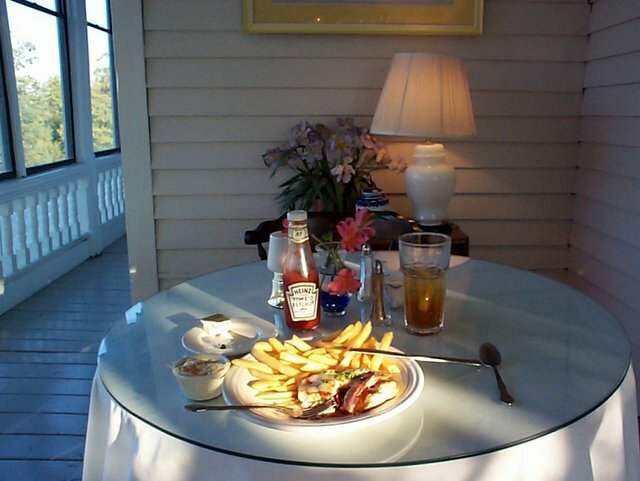 I ordered Monterey chicken with French fries, which I ate alone (as far as I know, they didn't have any other customers that night) on the screened in porch. I was not nearly as hungry as you might think, considering that all I'd eaten that day before going to Isabelle's were two donuts about nine hours earlier. I finished eating at 6:15, and began the drive south, back to my mundane life in Lawrenceville.